Primarily Italy, France, Germany and South America. Waldensians, Waldenses or Vaudois are names for a Christian spiritual movement that arose in the later Middle Ages. The sect originated in the late twelfth century as the Poor Men of Lyons, a band organized by Peter Waldo, a wealthy merchant of Lyon, who gave away his property around 1177 and went about preaching apostolic poverty as the way to perfection. They were persecuted as a heretical movement in the sixteenth century, endured near annihilation in the seventeenth century, and were then confronted with organized and generalized discrimination in the centuries that followed. Today, there are several active congregations of Waldensians in Europe, South America, and North America. Many groups have joined the Genevan or Reformed branch of Protestantism such as the Alliance of Reformed Churches of the Presbyterian Order. The Waldensian spiritual heritage includes proclaiming the Gospel, serving the marginalized, promoting social justice, fostering inter-religious work, and advocating respect for religious diversity and freedom of conscience. "Some Protestants, on this occasion, have fallen into the snare that was set for them...It is absolutely false, that these churches were ever found by Peter Waldo...it is a pure forgery." "It is not true, that Waldo gave this name to the inhabitants of the valleys: they were called Waldenses, or Vaudes, before his time, from the valleys in which they dwelt." "On the other hand, he "was called Valdus, or Waldo, because he received his religious notions from the inhabitants of the valleys." The claim of an ancient origin was for a long time accepted as valid by Protestant historians. The alexandrine Nobles Lessons, written in Provençal, was thought at one time to have been composed in 1100, but all scholars now date it between 1190 and 1240. Other scholars claimed Claudius, Bishop of Turin (died 840), Berengarius of Tours (died 1088), or other such men who had preceded Peter Waldo, as the founder of the sect. In the nineteenth century, however, critics came to the conclusion that the poem and other Waldensian documents offered as proof had been altered. For example, the respected Waldensian scholar Dr. Emilio Comba dismissed the theories related to the ancient origin of the Waldensians in the middle of the nineteenth century. According to the Waldense Church and the Waldense Scholarship, the Waldensians started with Peter Waldo, who began to preach on the streets of Lyon in 1177. He was a wealthy merchant and decided to give up all his worldly possessions; he was sick of his own affluence: that he had so much more than those around him. He went through the streets giving his money away and decided to become a wandering preacher who would beg for a living. He began to attract a following. Waldo had a philosophy very similar to Francis of Assisi. Preaching required official permission, which he was unable to secure from the Bishop in Lyon, and so in 1179 he met Pope Alexander III at the Third Council of the Lateran and asked for permission to preach. Walter Map, in De Nugis Curialium, narrates the discussions at one of these meetings. The pope, while praising Peter Waldo's ideal of poverty, ordered him not to preach unless he had the permission of the local clergy. He continued to preach without permission and by the early 1180s he and his followers were excommunicated and forced from Lyon. The Catholic church declared them heretics - the group's principal error was "contempt for ecclesiastical power" - that they dared to teach and preach outside of the control of the clergy "without divine inspiration." Though there is evidence early Waldensians affirmed doctrines like transubstantiation, prayers for the dead, and infant baptism, they were also accused of the ignorant teaching of "innumerable errors". The earliest Waldensians believed in poverty and austerity, promoting public preaching and the personal study of the scriptures. In 1179, they went to Rome, where Pope Alexander III blessed their life but forbade preaching without authorization from the local clergy. They disobeyed and began to preach according to their own understanding of scripture. Seen by the Roman Catholic Church as unorthodox, they were formally declared heretics by Pope Lucius III in 1184 and by the Fourth Lateran Council in 1215. In 1211, more than 80 were burned as heretics at Strasbourg, beginning several centuries of persecution that nearly destroyed the sect. Part of their legacy is recognized in the works of the writer Henri Arnaud (1641 – 1721). Some groups of Mennonites and Baptists in the attempt to trace apostolic succession through the Waldenses, claim that the Waldenses history extends back to the apostolic church. Many Roman Catholic and mainstream Protestant scholars contest that this has no basis in fact. The mainstream academic view is that the Waldensians were followers of Peter Waldo (or Valdes or Vaudes) and that any similarity in doctrine between the Waldensians and the early Christians is not necessarily the result of direct ancestry. In 1207, one of Waldo's early companions, Durand of Huesca, converted to Catholicism after debating with Bishop Diego of Osma and St. Dominic. Durand later went to Rome where he professed the Catholic faith to Innocent III. Innocent gave him permission to establish the Poor Catholics, a mendicant order, which continued the Waldensian preaching mission against the Cathars. The Franciscans and Dominicans later supplanted the Poor Catholics. Waldo and his followers developed a system whereby they would go from town to town and meet secretly with small groups of Waldensians. There they would confess sins and hold service. A traveling Waldensian preacher was known as a barba and could be either man or woman. (The idea of a female preacher was novel, almost revolutionary in and of itself, for the era.) The group would shelter and house the barba and help make arrangements to move on to the next town in secret. The members of the group were declared schismatics in 1184 in France and heretics more widely in 1215 by the Fourth Council of the Lateran's anathema. The rejection by the Church radicalized the movement; in terms of ideology the Waldensians became more obviously anti-Catholic - rejecting the authority of the clergy. Much of what is known about the Waldensians comes from reports from Reinerius Saccho (died 1259), a former Cathar who converted to Catholicism and wrote two reports for the Inquisition, Summa de Catharis et Pauperibus de Lugduno "Of the Sects of Modern Heretics" (1254). Waldo possibly died in the early thirteenth century, possibly in Germany, but he was never captured and his fate uncertain. As early as the twelfth century, the Waldensians were granted refuge in Piedmont by the Count of Savoy. While the House of Savoy itself remained strongly Roman Catholic, this gesture angered the Papacy. While the Holy See might have been willing to tolerate the continued presence of large Muslim populations in the Normans' Kingdom of Sicily, it was less than willing to accept a new Christian sect in Piedmont. In the thirteenth century, there was a substantial enough problem with clerical literacy that preaching to the laity in churches was hampered. Therefore, the field was somewhat clear for peripatetic evangelism of the Waldensians. At the same time, the lack of ecclesiastical structure and training meant that each sect could be at wide variance with others. The Waldensians became a diverse movement as it spread out across Europe in France, Italy, Germany, and Bohemia. Particular efforts against the movement began in the 1230s with the Inquisition seeking the leaders of the movements. The movement had been almost completely suppressed in southern France within 20 years but the persecution lasted beyond into the fourteenth century. The Waldenses were most successful in Dauphiné and Piedmont and had permanent communities in the Cottian Alps southwest of Turin. In 1487, at the insistence of Pope Innocent VIII, a persecution overwhelmed the Dauphiné Waldenses, but those in Piedmont defended themselves successfully. A crusade against Waldensians in the Dauphiné region of France was declared in 1487, and Papal representatives continued to devastate towns and villages into the mid-sixteenth century as the Waldensians became absorbed into the wider Protestant Reformation. When the news of the Reformation reached the Waldensian Valleys, the Tavola Valdese decided to seek fellowship with the nascent Protestantism. A Synod held 1526 in Laus, a town in Chisone valley, decided to send envoys to examine the new movement. In 1532, they met with German and Swiss Protestants and ultimately adapted their beliefs to those of the Reformed Church. Moreover, the Waldensian absorption into Protestantism led to their transformation from a sect on the edge of Catholicism that shared many Catholic beliefs into a Protestant church adhering to the theology of John Calvin, which differed much from the beliefs of Peter Waldo. From that moment onwards, the Church became the Italian branch of Reformed churches. The Swiss and French Reformed churches sent William Farel and Anthony Saunier to attend the Synod of Chamforan, which convened in Angrogna Valley on October 12, 1532. Farel invited them to join the Reformation and to leave secrecy. A "Confession of Faith", with Reformed doctrines, was formulated and the Waldensians decided to worship openly in French. The first French Bible translated by Pierre Robert Olivétan with the help of Calvin and published at Neuchâtel in 1535 was based in part on a New Testament in the Waldensian vernacular. The cost of its publication was defrayed by the churches in Waldensia who collected the sum of 1500 gold crowns for this purpose. Outside the Piedmont, the Waldenses joined the local Protestant churches in Bohemia, France and Germany. After they came out of clandestinity, the French king, Francis I, armed a crusade against the Waldensians of Provence, completely destroying them in France in 1545. The treaty of June 5, 1561 granted amnesty to the Protestants of the Valleys, including liberty of conscience and freedom to worship. Prisoners were released and fugitives were permitted to return home. The Reformation was also somewhat beneficial to the Vaudois, with the religious reformers showing them respect, but they still suffered in the French Wars of Religion (1562-1598). As early as 1631, Protestants scholars began to regard the Waldensians as early forerunners of the Reformation. In 1655, the Duke of Savoy commanded the Vaudois to attend Mass or remove to the upper valleys, giving them 20 days in which to sell their lands. In a most severe winter these targets of persecution, old men, women, little children and the sick waded through the icy waters, climbed the frozen peaks, and at length reached the homes of their impoverished brethren of the upper Valleys, where they were warmly received. There they found refuge and rest. Deceived by false reports of Vaudois resistance, the Duke sent an army. On April 24, 1655, at 4 A.M., the signal was given for a general massacre, which was so brutal it aroused indignation throughout Europe. Oliver Cromwell, then ruler in England, began petitioning on behalf of the Vaudois, writing letters, raising contributions, calling a general fast in England and threatening to send military forces to the rescue. The massacre prompted John Milton's famous poem on the Waldenses, "On the Late Massacre in Piedmont." The resistance which lasted into the 1660s was then led by a farmer, Josué Janavel. In 1685, Louis XIV revoked the Edict of Nantes, which had guaranteed freedom of religion to his Protestant subjects in France. The cousin of Louis, The Duke of Savoy, Victor Amadeus II followed his uncle in removing the protection of Protestants in the Piedmont. In the renewed persecution, an edict decreed that all inhabitants of the Valleys should publicly announce their error in religion within 25 days under penalty of death and banishment and the destruction of all the Vaudois churches. Armies of French and Piedmontese soldiers invaded the Valleys, laying them waste and perpetrating cruelties upon the inhabitants. A pastor, Henri Arnaud, sought help from William of Orange. He gathered a band of followers in Switzerland; and in 1689 made an attempt to regain their homes in the valleys. After the French Revolution, the Waldenses of Piedmont were assured liberty of conscience, and in 1848, the ruler of Savoy, King Charles Albert of Sardinia granted them civil rights. Copies of the Romaunt version of the Gospel of John were preserved in Paris and Dublin. The manuscripts were used as the basis of a work by Gilly published in 1848, in which it was related to the history of the New Testament in use by the Waldensians. A group of Waldensians settled in the United States at Valdese, North Carolina. Later sects, such as Anabaptists and Baptists, also began to point to the Waldensians as an example of earlier Christians who were not a part of the Roman Catholic Church, and held beliefs similar to their own. The Mennonite book, Martyrs Mirror lists them in this regard as it attempts to trace the history of believer's baptism back to the apostles. James Aitken Wylie (1808-1890) likewise believed that the Waldensians preserved the apostolic faith during the Middle Ages. Still later, Seventh-day Adventist Ellen G. White taught that the Waldenses were preservers of biblical truth during the great apostasy of the Roman Catholic Church. She believed that the Waldenses kept the seventh-day Sabbath, engaged in widespread missionary activity, and "planted the seeds of the Reformation" in Europe. Like the claims of ancient origins, these claims are not backed by any mainstream scholarship. However, others point to evidence of seventh-day keeping by at least some Waldenses prior to and about the time of the Reformation. In 1848, after many centuries of harsh persecution, the Waldensians (as well as the Jews) acquired legal freedom in the Kingdom of Piedmont-Sardinia as a result of the liberalising reforms which followed Charles Albert of Sardinia's granting a constitution (the Statuto Albertino). 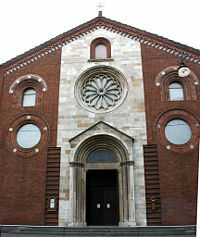 Subsequently the Waldensian Evangelical Church, as it became known, developed and spread through the Italian peninsula. The Waldensian church was able to gain converts by building schools in some of the poorer regions of Italy, including Sicily. There is still a Waldensian church in the town of Grotte, Province of Agrigento at the southwest part of the island. The Waldensians that belonged to this church were derided as "crazy Protestants" by their countrymen and those that married Waldensians were sometimes disowned by their predominantly Roman Catholic families. The Grottese that emigrated to Rochester, New York in 1910 and the years after that had their own church and minister until about the 1930s, when they merged with the Waring Baptist Church after their church was burned by the neighborhood Catholics. In 1975, the Waldensian Church joined the Italian Methodist Church to form the Union of Waldensian and Methodist Churches, which is a member of the World Council of Churches, of the World Alliance of Reformed Churches and of the World Methodist Council. It has 50,000 members (45,000 Waldensians, of whom 30,000 in Italy and some 15,000 divided between Argentina and Uruguay, and 5,000 Methodists). The first Waldensian settlers from Italy arrived in South America in 1856 and today the Waldensian Church of the Río de La Plata (which forms a united church with the Waldensian Evangelical Church) has approximately 40 congregations and 15,000 members shared between Uruguay and Argentina. Since colonial times there have been Waldensians who found freedom on American shores, as marked by the presence of them in New Jersey and Delaware. In the late 1800s, many Italians, among them Waldensians, emigrated to the United States. They founded communities in New York City, Chicago, Monett, Galveston and Rochester. Some Waldensians living in the Cottian Alps region of Northern Italy migrated to North Carolina in 1893 and founded the most notable Waldensian settlement in North America in Valdese, North Carolina. In 1906, through the initiative of church forces in New York City, Waldensian interest groups were invited to coalesce into a new entity, The American Waldensian Aid Society (AWS), organized "to collect funds and apply the same to the aid of the Waldensian Church in Italy and elsewhere…and to arouse and maintain interest throughout the US in the work of said Church…" Today, this organization continues as the American Waldensian Society. By the 1920s, most of the Waldensian churches and missions merged into the Presbyterian Church due to the cultural assimilation of the second and third generations. The work of the American Waldensian Society continues in the United States today. The mission of the American Waldensian Society is to foster dialogue and partnership among Waldensian Churches in Italy and South America and Christian churches within North America in order to promote a compelling vision of Waldensian Christian witness for North America. The vision of the society is to be a passionate witness in North America to the contemporary and historic Waldensian spiritual heritage: to Proclaim the Gospel; to Serve among the Marginalized; to Promote Social Justice; to Foster Inter-religious Work; and to Advocate Respect for Religious Diversity and Freedom of Conscience. The American Waldensian Society also assists churches, organizations and families in the promotion of Waldensian history and culture. The society is friend to those who work to preserve their millennial heritage among their descendants. For example, over the course of 41 years, the Old Colony Players in Valdese, North Carolina, have staged an outdoor drama telling the story of the Waldenses and the founding of Valdese. Both the Waldensian Presbyterian Church and the American Waldensian Society have links with the Italian-based Waldensian Evangelical Church, but, differently to the South American Waldensian communities, they are independent from it. There exists a group under the name "The Old Waldensian Church of Anabaptists" that claim to have originally come from the Italian organization but after coming to America has maintained independence from church organizations or government incorporation including any tax exemption status. Once a sizable Church they have dwindled today to a very small group in Ohio and another in Pennsylvania. In 1698, approximately 3000 Waldenses fled from Italy and came to South Rhine valley. Most of them returned to their Piedmont valleys, but those who remained in Germany were assimilated by the State Churches (Lutheran and Reformed) and ten congregations exist today as part of the Evangelische Kirche in Deutschland. The present Waldensian Church considers itself to be a Christian Protestant church of the Reformed tradition originally framed by John Calvin. It recognizes as its doctrinal standard the confession of faith published in 1655 and based on the Reformed confession of 1559. It admits only two sacraments, baptism and the Lord's Supper. Supreme authority in the body is exercised by an annual synod, and the affairs of the individual congregations are administered by a consistory under the presidency of the pastor. Among the earliest beliefs taught by the Waldensians were the rejecting of Roman Catholic traditions such as purgatory, the mass, and of indulgences and prayers for the dead. They considered all lying as a serious sin, they refused to take oaths and considered the shedding of human blood a crime. They consequently condemned war and the death penalty. In the pre-Reformation days of the movement, they also taught that the validity of the sacraments depended on the worthiness of the minister. The Waldensian emphized voluntary poverty. They challenged the authority of the Roman Catholic Church insofar as it was not based on the Scriptures. Among the Waldenses the perfect, bound by the vow of poverty, wandered about from place to place preaching. Such an itinerant life was ill-suited for the married state, and to the profession of poverty they added the vow of chastity. Married persons who desired to join them were permitted to dissolve their union without the consent of their partner. Orderly government was secured by the additional vow of obedience to superiors. The perfect were not allowed to perform manual labour, but were to depend for their subsistence on the members of the sect known as the friends. These continued to live in the world, married, owned property, and engaged in secular pursuits. Their generosity and alms were to provide for the material needs of the perfect. The friends remained in union with the Roman Catholic Church and continued to receive its sacraments with the exception of penance, for which they sought out, whenever possible, one of their own ministers. The perfect were divided into the three classes of bishops, priests, and deacons. The bishop, called "major" or "majoralis," preached and administered the sacraments of penance, Eucharist, and Holy Orders. The celebration of the Eucharist, frequent perhaps in the early period, soon took place only on Holy Thursday. The priest preached and enjoyed limited faculties for the hearing of confessions. The deacon, named "junior" or "minor," acted as assistant to the higher orders and by the collection of alms relieved them of all material care. The bishop was elected by a joint meeting of priests and deacons. In his consecration, as well as in the ordination of the other members of the clergy, the laying-on of hands was the principal element; but the recitation of the Lord's Prayer, so important in the Waldensian liturgy, was also a prominent feature. The power of jurisdiction seems to have been exercised exclusively by one bishop, known as the "rector," who was the highest executive officer. Supreme legislative power was vested in the general convention or general chapter, which met once or twice a year, and was originally composed of the perfect but at a later date only of the senior members among them. It considered the general situation of the sect, examined the religious condition of the individual districts, admitted to the episcopate, priesthood, or diaconate, and pronounced upon the admission of new members and the expulsion of unworthy ones. ↑ William Jones. History of the Christian Church. Vol II, 2. ↑ 6.00 6.01 6.02 6.03 6.04 6.05 6.06 6.07 6.08 6.09 6.10 6.11 6.12 6.13 6.14 6.15 6.16 6.17 6.18 6.19 6.20 6.21 6.22 6.23 6.24 6.25 6.26 Nicholas Weber, The Catholic Encyclopedia Vol. 15, 1912 ed. "Waldenses.". New Advent.org. Retrieved February 25, 2009. ↑ Enrico Bosio, "La Nobla Leyczon considérée au point de vue de la doctrine, de la morale et de l’histoire," Bulletin de la Societe d'Histoire Vaudoise, n. 2 (dic. 1885): 20-36. ↑ 8.0 8.1 8.2 8.3 American Waldensian Society Retrieved February 17, 2009. ↑ Rosalind B. Brooke, The Coming of the Friars (NY: Barnes and Noble, 1975), 72-73. ↑ Reinarius Saccho, Of the Sects of the Modern Heretics Retrieved February 17, 2009. ↑ Church structure described by American Waldensian Society - see second paragraph. Retrieved February 17, 2009. ↑ James A. Wylie. History of Protestantism Book One, 62. doctrine.org. Retrieved February 25, 2009. ↑ "On the Late Massacre in Piedmont.".Dartmouth. Retrieved February 19, 2009. ↑ Janavel, Combats, Exil et Pouvoir d'un Grand Capitaine Retrieved February 17, 2009. ↑ William S. Gilly, The Romaunt Version of the Gospel according to St. John, from MSS. preserved in Trinity College, Dublin, and in the Bibliothèque du Roi, Paris. With an introductory history of the version of the New Testament, anciently in use among the old Waldenses, and remarks on the texts of the Dublin, Paris, Grenoble, Zurich and Lyons MSS. of that version. ↑ J. A. Wylie, The History of Protestantism doctrine.org. Retrieved February 17, 2009. ↑ Ellen G. White. The Great Controversy. Chapter 4–The Waldenses. whiteestate.org. Retrieved February 17, 2009. ↑ Did the Waldenses keep the seventh day sabbath? Retrieved February 17, 2009. ↑ J. N. Andrews. History of the Sabbath. Chapter 21–The Sabbath During the Dark Ages. Retrieved February 25, 2009. ↑ Andrews. History of the Sabbath [http://dedication.www3.50megs.com/historyofsabbath/hos_twentyfive.html#Keepers |pages=Chapter 25–Sabbath Keepers During The Reformation Times From The Fifteenth To The Seventeenth Century]. Retrieved February 25, 2009. ↑ Waldensian Presbyterian Church Retrieved February 17, 2009. ↑ Centennial Waldensian.org. Retrieved February 17, 2009. ↑ From this Day Forward oldcolonyplayers.com. Retrieved February 17, 2009. Arnold, Dr. Marvin M., "History of Churches in Michigan and the Ohio Valley," 10. Essay, Washington, MI: Arno Publications. Audisio, Gabriel. The Waldensian Dissent: Persecution and Survival, c.1170 - c.1570. 1999. (Cambridge Medieval Textbooks.) Cambridge: Cambridge University Press, ISBN 0521559847. Brooke, Rosalind B. The Coming of the Friars. NY: Barnes and Noble, 1975. Cameron, Euan. The Waldenses: Rejections of Holy Church in Medieval Europe. 2001. ISBN 0631224971. Muston, Alexis, The Israel of the Alps: a complete history of the Waldenses and their colonies: prepared in great part from unpublished documents. reprint ed. (1978) ISBN 0404161405. Translated by John Montgomery, 1866. Wylie, James Aitken. History of the Waldenses. ', (c.1860) ISBN 1572581859 .The Refored Reader. Retrieved February 25, 2009. This page was last modified on 25 February 2009, at 10:36.